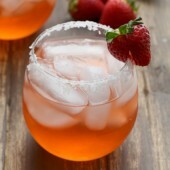 Fresh strawberry margaritas made with homemade strawberry simple syrup! A perfect drink for Cinco de Mayo celebrations, or any night! Carefully dip rim of glasses into lime juice, followed by salt and/or sugar mixture. Fill with ice. Fill a cocktail shaker with ice. Add triple sec, tequila, lime juice and strawberry simple syrup. Shake well. Strain into prepared glass and garnish with strawberries and/or limes.